years ago on 16 August. TO COMMEMORATE THE THIRTIETH ANNIVERSARY of his death (2007), Warner Classics and Jazz are releasing Symphonic Elvis  a collection of The King's greatest hits, transformed into twelve fantastic and uplifting orchestral arrangements. 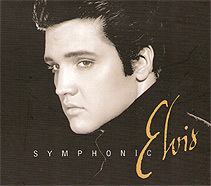 Symphonic Elvis features the Memphis Symphony Orchestra, conducted by Italian Ettore Stratta. Guest appearances by Elvis's former band members include guitarists (and Elvis's first manager) Scotty Moore and Reggie Young, pianist Bobby Wood, bassist Mike Leech, saxophonist Boots Randolph and harmonica wizard Charlie McCoy. The Legend lives on in this delightful tribute. The Memphis Symphony Orchestra is America's premier Southern orchestra but there is a very personal link to Elvis. Since 1993, they have marked the singer's birthday (January 8) with an Elvis Birthday Concert featuring symphonic arrangements of Elvis tunes. The idea for Symphonic Elvis has its roots in 1968 when Elvis was involved in a tele-vision show and sang with an orchestra. He was so impressed with the results that it is very likely he would have appreciated this excellent jazzy, catchy album. You don't have to be an Elvis fan (isn't everybody?) to be charmed by Symphonic Elvis. But if you are, you will recognise his well-known hits: including a spirited Return to Sender, relaxing Love Me Tender, melodious Heartbreak Hotel, soulful Are You Lonesome Tonight, and jive-inspiring That's All Right. Pure Elvis it is not  and neither is it meant to be. As Elvis admirer Cliff Richard would say: "put on your dancing shoes; dance away your blues…"
 Symphonic Elvis is on sale now (Warner Classics & Jazz).